My first Christmas as a mom I learned something really quickly: I had no idea how to keep Christ in Christmas if Santa Claus was looming large. And he was looming incredibly large. It was obvious to me that there were parents who had done a good job of raising kids who knew the reason for the season and enjoyed Santa’s appearance on Christmas Eve, but I just knew that what they had in their personalities, gifts, talents, homes, and communities was not what I had. I noticed that some families have only St. Nicholas and no Santa, some the exact opposite. Some have St. Nick, Santa, and the Three Wisemen, and others have some variation of those. I saw each done really well. After that first Christmas season I wrote my open letter to Santa Claus and the next year I shared how I was making it work in our home with a couple of little kids. This year things are a little different. We have school aged kids in public and parochial schools. They are young enough to still believe and old enough to hear and wonder about why Santa is different at our house than at their classmates. Also, I am less uptight. #1 Blend St. Nick and Santa Claus with much, much, much more emphasis on St. Nick. We use the names interchangeably and images of both are called by either name. However, when I use an image of St. Nick it is always of a Santa-looking bishop and not the traditional Santa. Nine times out of ten when I call him by name I use St. Nick or St. Nicholas. #2 St. Nick fills only our stockings and our stockings are filled the eve of his feast day (Dec 6). It was such a thrill for me and Travis to wake up and see what Santa would bring us and that's a thrill we still want to give our kids. This morning my kids were literally jumping up and down in a circle screaming that "Santa is coming in two days! St. Nicholas is coming!!!" The cool bonus for our kids is that they will feel this excited again on Christmas Eve - when they get gifts from Travis and me -and again right before Epiphany - when the Wise Men leave them another gift, usually something small or a group gift. #3 Santa / St. Nick brings gold coins, pajamas, and maybe one extra something small. We spend a lot of time talking about St. Nicholas and how he saved those girls from a life of prostitution by giving them money for dowries, except I don't go into that much detail at this point. They understand why they are getting gold chocolate coins from Santa. The extra something small this year will be a Christmas movie for them all to share with a note that says something about how he was talking to Jesus in Heaven and that Mommy and Daddy had been praying and had mentioned that the kids were really excited to watch How the Grinch Stole Christmas. (This is all true, you know, more or less.) I'll - I mean he'll say something about how the lesson the Grinch learns is really important and remind them that Jesus is why we celebrate Christmas. This gives me the opportunity to thrill them some more (Santa knows what they want! ), to reaffirm their Catholic faith (Heaven, saints, salvation), and establish and re-establish that Santa is not a BIG gift giving machine. They can hope for everything in the catalog and Santa is generous and thoughtful but he does not go into debt. You know what I mean. #4 Discuss that Santa / St. Nick visits some people on December 6th and some people on December 24th. We tell the kids that Santa asked some parents if he could come on his feast day to make his travels a little easier on Christmas Eve and we said Yes. We explain to our kids that this means that they'll get gifts now and later and they love that. #5 We don't talk up the North Pole and elves but we don't say they don't exist either. We let the kids lead those conversations - we let them believe and imagine and daydream. If there's a natural way to do it, we slip in that St. Nicholas lives in Heaven, and we do it in a way that does not negate what they believe about his workshop at the North Pole. #6 We read books and watch movies about both men. The Night Before Christmas and The Polar Express will both be enjoyed at our house. So will the Veggie Tales St. Nicholas: A Story of Joyful Giving and a St. Nicholas: the Real Story of the Christmas Legend. I want my kids to believe in magic but I also want to lay a foundation so when the day comes that they learn Santa Claus is not real they will still know that St. Nicholas is. The love, the joy, the excitement - all of that is real because St. Nicholas is real and as a real saint in Heaven he points us to an even greater Truth. There's a lot of good ways to build traditions and each family will have its own unique twist on things. And how beautiful that is! These six steps are what works for us, for our family, for our personalities, and for our values. I'm sure it will continue to change as my kids age and go through different phases, but for now this is how we do it. Thanks so much for this, Bonnie. We also do gifts from St. Nicholas on his feast day and I was really struck by how much Lucia is talking about Santa Clause this year - she's only three (well, she will be as of tomorrow) and she'd not around other kids much! But, her birthday party is on Saturday so we're having a St. Nicholas party as her birthday party this year so hopefully she'll get more excited about St. Nicholas. Right now for us, Santa Clause and St. Nick are the same person. Clark is really loving all of our Santa statues/ dancing Santa's so I think he just likes that the Santa statues coming out means it's Christmas time which makes him really excited. I'm not sure he actually understands yet that Santa brings gifts on Christmas Eve. We have a few nativity sets and one that the kids can play with and he is excited about the baby Jesus just as much as he is about Santa so that makes me happy. We try to have a balance. 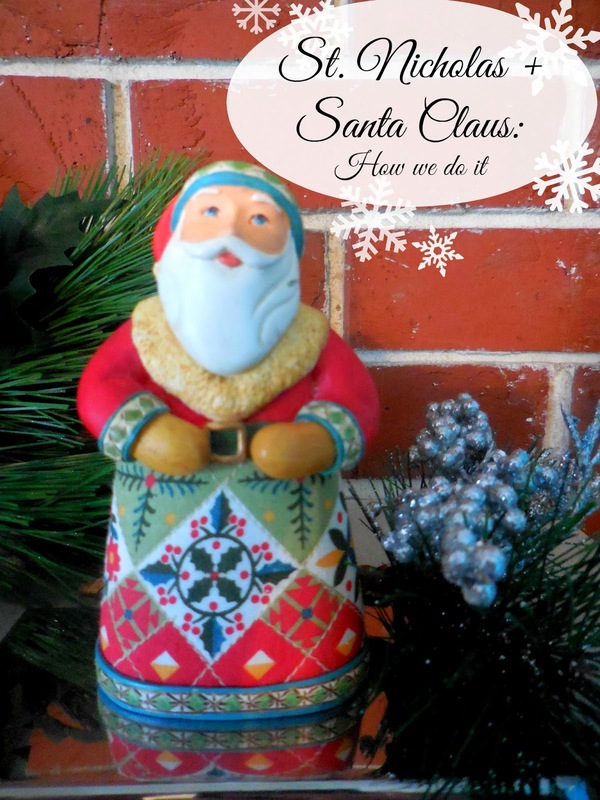 We have our fat jolly Santa statues and some that look more like bishop St. Nick. And my favorite statue is the one of Santa kneeling by baby Jesus in the manger... We have a good book that goes with that statue too. You have great tips on how to blend both Santa and St. Nick! Great post! This is my two sense: I don't think children have the issue with understanding the concept of a St. Nicholas figure whether by any name he is called. I think adults sometimes lack the ability to believe in that spirit of generousity. I know I let myself get jaded before seeing my chickadees awe and wonder at this time of year. Love hearing how you & your family approach it, Bonnie! Thanks so much for sharing. That's very much how we do it at our house too. We also leave cookies and milk for St Nick on the 5th as well as the 24th. I really appreciate these kinds of posts, even tough I don't have kids. Its helpful to hear what other families do...what has gotten me nervous about Santa and Jesus and St. Nick is I was the weird kid who was pretty upset to learn about Santa. I just wonder and even worry sometimes what if that happened when I had kids? ya know...good post Bonnie! I have read SO MANY posts on this topic this year. Ellen is finally at an age where this is an issue at our house. And, I have been struggling with what to do. I am happy to announce that THIS is the way I want to do it. Like I said, I've read so much, but this is what I want!